At least, that’s how I remember the adage. Halfbeak has posted a creation on Flickr that makes fantastic use of stickers to add contrast and detail. I’m always a fan of checker patterns, and the stripe on the helmet is a great touch. 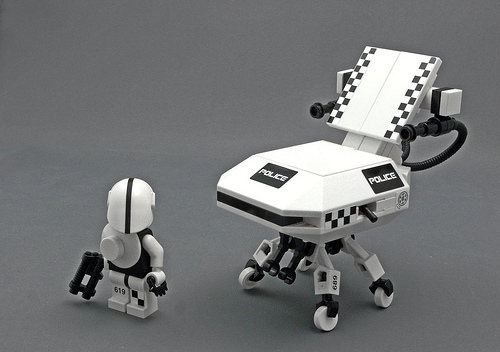 The aesthetic reminds me of THX-1138, while the name (Koma Police) has gotten a song stuck in my head.